Sustainable wood is wood from sustainably managed forests. This type of wood is renewable due to the fact that the forest stewards take care of the landscape, preventing damage to wildlife, watersheds, and ecosystems. Furthermore, these forest stewards also manage the trees themselves. In this case, sustainability indicates that this forest should still be there for the generations to come, being able to absorb all the carbon dioxide emission. In the past, people just went to buy wood, without thinking how it was harvested or where it came from. However, nowadays, we know how important it is to preserve the forests, woodlands, and trees. This has become essential for us to survive. Hence, buying wood today is no longer that simple. You should be aware of how to buy sustainable wood in order not to encourage deforestation or illegal logging. Wood from sustainable sources is cut down, and then forest stewards take care of the bare areas that remained behind. If those areas are not carefully treated, they will find it hard to recover. Otherwise, illegal logging can lead to wholesale destruction. We should start using sustainable wood and buy furniture carved from sustainable wood because the exotic forests in the Amazon are slowly dying. Even if you might think that this does not matter for you since you do not leave there, this selfish thought is destructive. It is true that those incredible forests are far away but think twice before buying teak garden furniture of mahogany flooring. Think about where that wood is coming from and how illegal deforestation destroyed that forest. When buying unsustainable wood, it means that you somehow supported hundreds of habitats in the rainforest to be destroyed. You contributed to the destruction of those ecosystems in the forest, and you somehow supported illegal logging. That is why the luxurious forests now turned into bare land. Purchasing unsustainable wood has a tremendous effect on the areas where it has been harvested. This includes threatening the lifestyles and lives of indigenous people living there, making many species homeless, hunting for endangered species and human rights abuses. Statistics show that only 8% of all the forests in the world are protected from destruction. The demand for wood is inexhaustible, as well as the timber industry. Despite conservationists’ best efforts, this wood is unsustainablly harvested. Lawmakers and governments do their best to prevent this type of behavior. However, much of the time the wood is illegally harvested. This mainly happens because money seems to speak louder than common sense and we prefer to have full pockets and empty lands, while carbon dioxide emissions are increasing. For instance, in Malaysia, the production of timber demands even more trees than there are in existence. Sometimes, to meet the demand, people import wood from Indonesia. By using sustainable wood we prevent illegal logging, disapproving irresponsible practices that can harm various ecosystems. 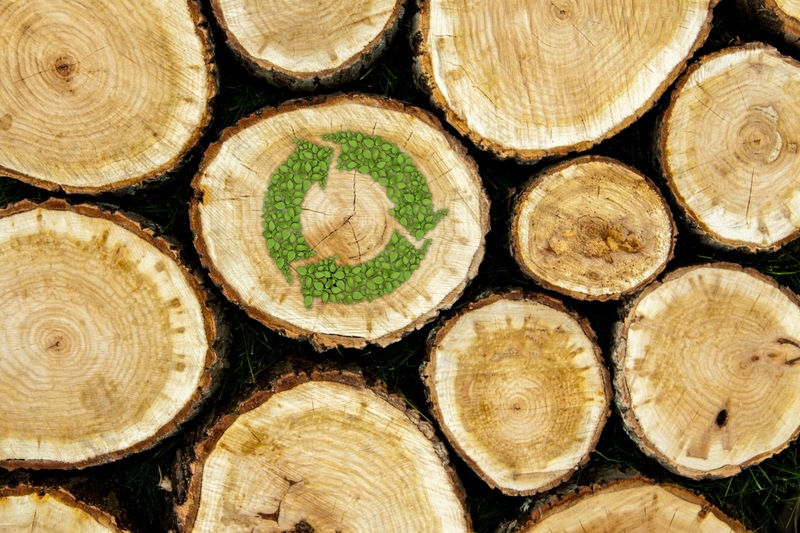 Which types of wood are most sustainable? If we want to support the future of our planet and to diminish the carbon dioxide emissions, annihilating climate change effects, we need to use sustainable wood. Timber is classified as either hardwood, like oak and beech, or softwood, such as fir and pine. The fast-growing species, like pine trees, are more sustainable than slow-growing trees, like oak. This happens only because the fast-growing species are replaceable. Oak forests need to be carefully managed in order for them to be sustainable and harvested in the right way. The EU introduced legal measures in order to protect the forests and woodlands. Luckily, nowadays, more trees are planted than cut down. This is good news since the EU forests actually grow instead of diminishing. The law imposes a minimum requirement regarding the process of replacing the harvested trees. Furthermore, lawmakers also limit the annual harvest. Hence, one of the safest choices is buying European wood. There are a few types of wood which should be avoided since they are particularly endangered. The list of species includes Burmese teak, Brazilian mahogany, ebony, wenge, sapelee, and murbau. On the other hand, the list of sustainable wood we can use includes oak, bamboo, douglas fir, mahogany, and teak. Usually, people use teak in furniture and building projects. This type of wood comes from Africa and Burma. However, Burma sells teak illegally, being harvested from ancient forests. Furthermore, the African teak is really scarce nowadays that it may as well be on the endangered list. Depending on its origin, this type of wood can be sustainable. We know that bamboo generally grows across wide areas in the north Australia, in the Americas, sub-Saharan Africa and Asia. This type of wood is naturally sustainable, and it is amazingly strong and light. Manufacturers use bamboo for floors, furniture, fences, and scaffolding. However, you need to find the appropriate source from which you can purchase bamboo because a billion people depend on bamboo. If this type of wood is not wisely harvested, then they suffer. Mahogany comes from Africa, Asia, and Brazil. Generally, people use it in building projects and garden furniture. In Asia, over 70 species of mahogany grow there. Unfortunately, over 50% of these species are endangered. Oak originates in Australia, the USA, Europe and Britain. You can use it for flooring and furniture projects. Nevertheless, you need to know that forest stewards from Ukraine, Poland and Russia who sell oak obtain it through illegal logging while oak from Estonia may be illegal. Furthermore, in Portugal and Spain, oak forests need better management. Douglas fir comes from North America and Europe and people use it to make furniture as well as in paneling and building projects. The wood that comes from Europe originates in well-managed plantations. On the other hand, the one coming from North America is from coastal rainforests where people irresponsibly cut down on trees. Sustainable wood helps us have a sustainable lifestyle, avoiding to use wood obtained through illegal logging. When using sustainable wood, we protect the environment, and we are sure that the forest stewards take care of those forests to grow back. The most crucial thing about sustainable wood is the forests’ management.